Take the letters of the alphabet and assign them a numerical value: a = 1, b = 2, c = 3 etc. through to z = 26. 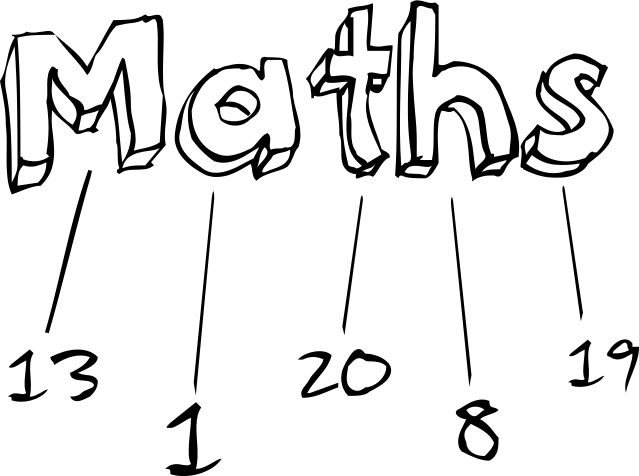 So the word maths is made from the numbers 13, 1, 20, 8 and 19 and if you multiply them together you get 39,520. Can you find any other words that also have the product 39,520? And it can be used to introduce that often tricky concept of proof: can you prove that the shortest possible word must contain at least 5 letters? I’ve got a few answers, but I’m not going to share them with you yet. Have a think about it first – you can always give your answers, or proofs, in the comments section. I’ll provide my solutions in a later post, but for now get your thinking caps on and have a go at solving this problem. This entry was posted in Numeracy, Puzzles and tagged puzzle. Bookmark the permalink. Post a comment or leave a trackback: Trackback URL. I believe that I have a four-letter word. Google reveals that they are, amongst other things, types of crusty roll sandwiches from Philadelphia. Curious to know what the word is. Don’t want to give away too much in the comments and spoil the fun of anyone trying to solve the puzzle, but unless I see your four letter word I shan’t be convinced that you have found one that works. The gauntlet has been thrown down!